Crimson Trace LG305 Lasergrips Rubber S&W J Frame 633nm .5@50ft Blk in. 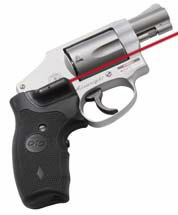 These Crimson Trace Lasergrips fit Smith Wesson revolvers and operate using front placement instinctive activation. They have useradjustable windage and elevation. Two batteries provide more than four hours of on time use. These Lasergrip models feature a hard polymer surface well suited for personal defense or rubber overmold with a polymer base. The smooth polymer material provides for snagfree draws and is hard enough to meet strict standards for durability and reliability.